Taking subway is the fastest and cheapest way to travel around Beijing. Click here to view How to Take Subway in Beijing. We have prepared several subway tours for your reference. The following are all one day itinerary. Walk or take a bus to your nearest subway station and try to take subway line 4 or interchange for subway line 4. Take subway line 4 and get off at Beigongmen(北宫门). Come out from Exit D or A1. Beigongmen literally means the north gate of the Summer Palace. 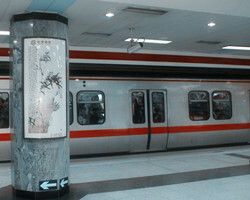 After visiting the Summer Palace, take subway line 4 again at Beijinggongmen (Tiangongyuan Direction). Get off at Haidianhuangzhuang(海淀黄庄). Then interchange for line 10 (Jinsong direction). Get off at Beitucheng(北土城). Interchange for line 8 and get off at Olympic Park(奥林匹克公园). Come out from Exit D. You will be in the Olympic Park. You can visit the Bird’Nest (Beijing National Stadium ) and Water Cube (Beijign National Aquatics Center). Walk or take a bus to your nearest subway station and try to take subway line 5 or interchange for subway line 5. Take subway line 5 and get off at East Temple of Heaven(天坛东). Then you can enter Temple of Heaven from east gate. Take subway line 5 again and interchange for subway line 1 at Dongdan.Take subway line 1 and get off at Tian’anmen East(天安门东) . Then walk to Tiananmen Square. The Forbidden City is to the north of Tian’anmen Square. You can enter the Forbidden City from the northern gate and exit from southern gate.